Please make sure to use the speed charger with your device's manufacturer approved cables. - With Quick Charge 3.0 Technology you can charge you Qualcomm Compatible device up to 80% in only 30 minutes! - This USB wall charger may charge all USB devices such as phones, tablets, kindles, powerbanks, Speakers, and USB Powered Devices. - Small sleek design with foldable plug makes it easy to travel with the PowerBear power charger where ever you go. - Easy to use just plug into the wall and charge your device. - Fail proof built-in IC protects your devices from short circuiting and overheating. Safety approved standards from FCC, CE, and RoHS. - LED light indicates whether or not the wall charger is on. GO BEYOND YOUR POWER: Keep your phone powered with the PowerBear 18W Wall Charger. Charge your devices up to 4 times faster than standard 18W chargers. 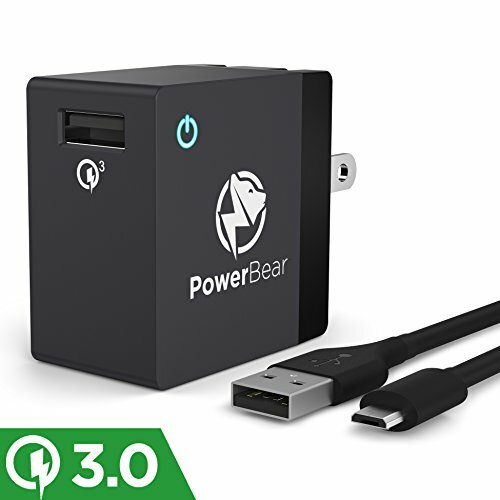 With built in Quick Charge 3.0 technology, this PowerBear USB port charger makes it the fastest charger on the market! UNIVERSAL COMPATIBILITY: This charger is backward compatible for all versions of Quick Charge technology. It delivers a high-power quick charge for virtually all devices including: Samsung, Apple iPhones & iPads, Apple Watches, Microsoft, Google, Nokia, Sony, LG, HTC, Blackberry, Huawei, and more! TRAVEL READY: The compact design of the turbo power charger allows you to take it anywhere. The foldable plug makes it easy to store the certified charger plug easily and safely. Advanced electronics also allow input voltage to range from 100V to 240V making this fast charging port usable around the world. SAFETY ASSURANCE: A high rated power adapter ensures that your device is protected from power surges and spikes. The portable charger is also made with a high quality plastic body that resists drops and is fire resistant. 24 MONTH WARRANTY: PowerBear stands behind our products. If you are not 100% satisfied with your new power charger, just let us know! Contact us via Amazon and we can help with any issues that you may have. Customer satisfaction is our top priority, and that's the PowerBear guarantee!